The company that runs the remnants of former UK automaker MG Rover has dropped a reference to its Chinese parent from its name. NAC MG UK has changed its name to MG Motor UK to emphasize the MG name, a company spokesman said. Nanjing Automobile Company or NAC bought MG Rover's assets in July 2005, three months after the UK's last domestically owned volume carmaker collapsed through financial difficulties. In December 2007, NAC was bought by its larger Chinese rival SAIC. MG Motor UK said the name was changed to reinforce the MG brand. "The new name will help strengthen the company's reputation and re-emergence in the market by emphasizing the already well known MG brand," the company spokesman said. MG Motor UK is based at the former MG Rover factory in Longbridge, central England. 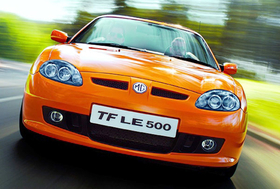 NAC launched the MG TF LE500 roadster in the UK in September. The two-seater sports car is assembled at Longbridge from kits shipped from China. Last year, the company said it expected to introduce further models to Longbridge in the next three years. No firm export plans have yet been announced. Meanwhile, about 30 workers have been laid off at Longbridge. The Chinese-owned company has laid off up to 30 temporary contract workers in the latest blow to manufacturing in the West Midlands industrial heartland of the UK. The lay-offs are among staff who recently transferred from the Shanghai Motor Technical Centre in Leamington, central England, -- a wholly-owned subsidiary of SAIC/Nanjing -- to Longbridge. The firms Longbridge workforce now numbers about 380, with 250 transferred from Leamington to add to the 130 already on site.